Easy to install, No Adhesive Required. Self-installed in basement laundry room. After our basement was flooded in historic rains this spring, we looked for alternative flooring. These slate flex tiles from the designer series at Rubber Flooring, Inc turned out to be practical, and beautiful. 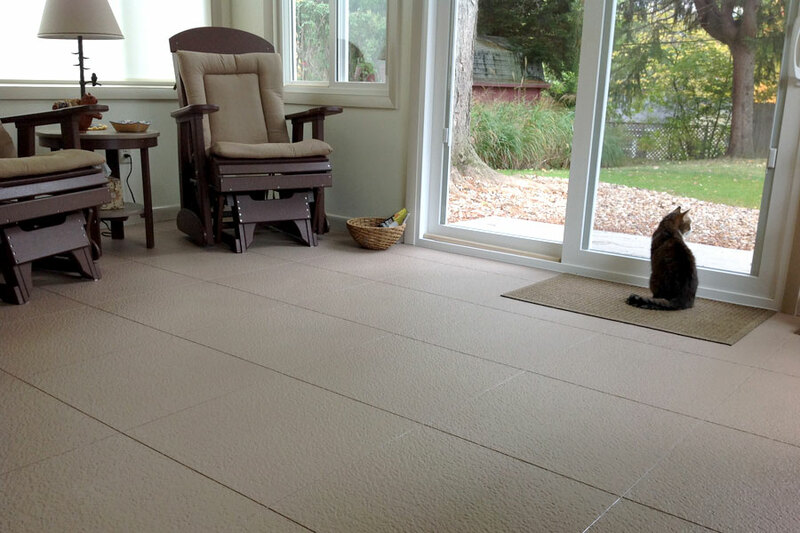 They are very easy to install, are very comfortable to walk/work on, and look like they were made for our needs. We have lived in this house many years and have had carpet, vinyl and painted floors. This is my favorite! LOVE the tiles! 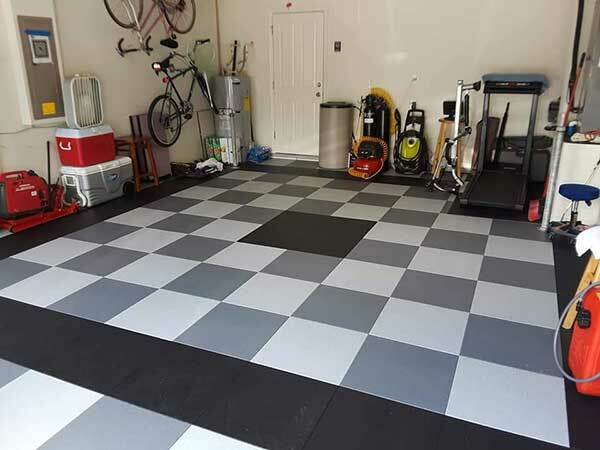 So very clean looking, no grout lines, no bulges just seamless tiles that look like ceramic tile in the garage! We hired a crew to install the tiles because we didn't have the time or energy to do it ourselves but this crew of 5 had this knocked out in 4 hours. The only unfortunate thing was we were short a case and had to reorder one. They tell you that the darker tiles have a color difference but so do the lighter ones. 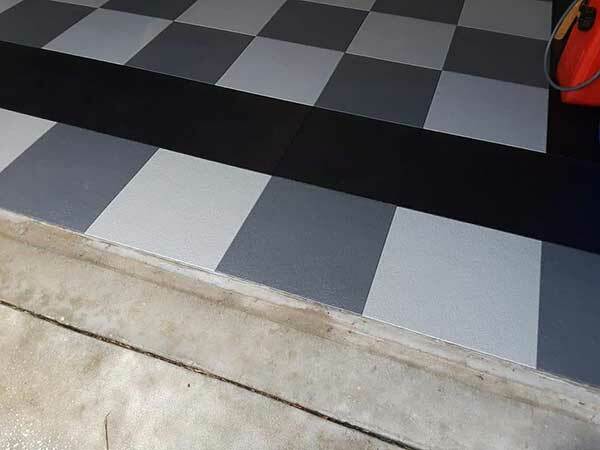 We have black tiles under the cars and tan ones along the sides of the garage just to break up all the black. We were short a case of tan so reordered it and there's a noticeable color difference but it's the garage, right? The black hides dirt great but does show water stains from rain dripping off the car but cleans like ceramic tile, just a swipe with the Swifer wet jet and it's all done. Vacuums like a dream too. We are very pleased with the product. One other caveat... if you live in a subdivision with narrow streets, a commercial carrier won't be able to access your property to deliver the tiles. Each box contained 6 tiles, looks like pizza boxes but kind of heavy! We had to courier ours up with a neighbor's flatbed pick up truck, otherwise? not sure what we'd have done. We are extremely happy with the way our garage turned out. 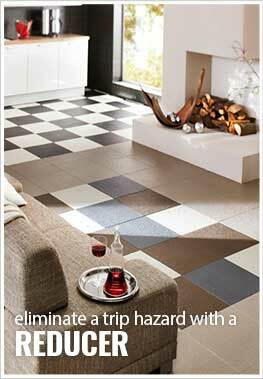 We picked this style tile because the interlocking is hidden and you end up with a straight seam. Installation was extremely easy. As with any project, the 20 percent takes 80 percent of the time. In our case we had a water heater, water softener, and air exchange to work around that took most of our time. 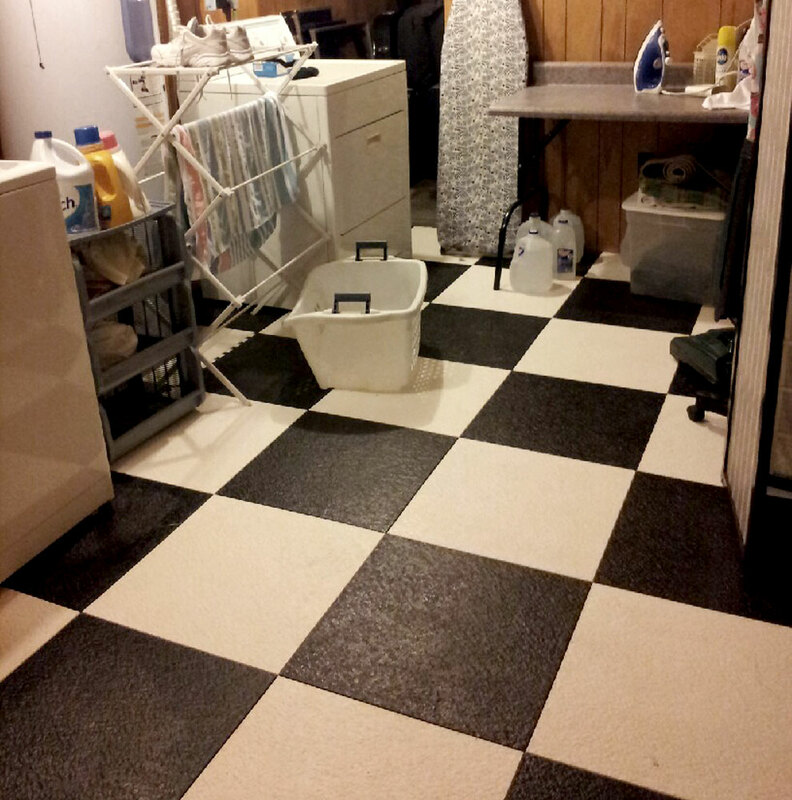 We did a checkerboard pattern light and dark grey with black boarder and black square in the center.